It was very common for a long time to have the dish mounted on the highest point on the roof. After all, this gives you the best chance of avoiding problems from nearby trees. 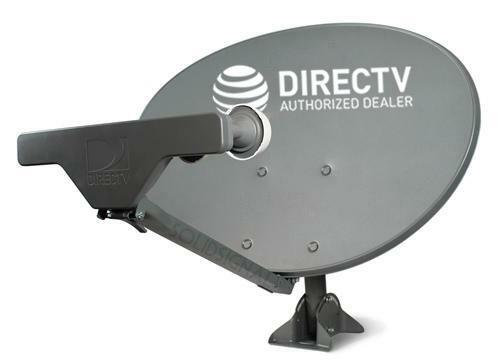 If you were worried about line-of-sight for any reason, you tended to put the dish up on a roof. Roof mounting can involve something like a tripod to get the dish even higher if needed. However, the big downside to roof mounting is that you’re making holes in the roof. You can patch them and waterproof them as best as you can, but really, you’re making holes in the roof. If that makes you worried, roof mounting might not be for you. Roof mounting is also hard to achieve if you have a tile roof. We have a system for doing it but it’s a little pricey. If you have a mostly flat roof, you can consider a non-penetrating roof mount. This mount uses jugs of water or cinder blocks to hold it in place. This solution is generally used in commercial installations but it is a way to get a satellite dish up on your roof without drilling holes. If you have a pitched roof (and most homes do) then you could consider this mount as well which is designed to work at the top of the roof. Unless you really need to mount the dish up high, eave mounting is a better solution. Eave mounting means mounting the dish on the side of the house, either on the molding or on the wall. The advantage here is pretty clear. The best way to keep a dish steady is to bolt it in, so you’re going to make some holes. It’s a lot better to have those holes on the side of the house where rain is less likely to get in. There’s a huge variety of wall mounts available. Some are designed to work behind or under the molding, some like the one you see above work well attached to the side of the house, and others work in special installations. Obviously every situation is going to be different. However, there is a clear benefit to mounting on the side of the house. Ideally you should even mount the dish on a wall that goes into a garage rather than into the house itself. If you can do it, wall mounting is going to be more secure, provide better resistance against wind, and obviously there is no damage to the roof at all which will help you sleep a lot better. However, the choice is up to you. You can pay very little for a simple mount or you can get really complicated depending on what you need. Before you decide, take a look at the excellent selection of mounting supplies available now at Solid Signal.